Bio Senshi Dan (, バイオ戦士DAN インクリーザーとの闘い?, lit. Bio Warrior Dan: Battle with the Inkuriza), sometimes listed as Bio Senshi Dan Increaser tono Tatakai, is an action game developed by Atlus for the Famicom, and published by Jaleco in 1987. It is an action, exploration game, where the player travels back in time to prevent an alien take-over of his home planet. It can best be described as a cross between Castlevania and Xenophobe, with a dash of Metroid mixed in. In the game, the player must explore five stages, each of which contain a boss which must be defeated in order to proceed to the next stage. A rather unique feature of these bosses is that the amount of strength they possess when you fight them is relative to the amount of time it takes for you to reach them. The longer you take to explore the level and find your way around, the stronger they become. You may choose to rush to the boss and reach it before it gains too much strength, but you may risk passing up crucial items that make the fight much easier. 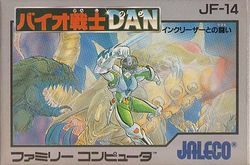 Bio Senshi Dan was only published in Japan, however a prototype of the North American release is known to have existed, and was leaked onto the internet many years later. In North America, it was to be released under the title Bashi Bazook: Morphoid Masher. Before the prototype became available, the fan translation group known as Abstract Crouton Productions developed and published a translation of the game. Download the patch here. It is the year 2081 on Earth, which is currently being taken over by a race of rapid evolution super beings known as the Inkuriza. Humans are being wiped off the face of the planet at an alarming rate and extinction is all but assured. In one desperate attempt to save humanity, a young man named Dan is provided with the most advanced biotechnology available, and sent through a Time Warp to the year 1999, when it is still possible to wipe out the Inkuriza intrusion, and save mankind. This page was last edited on 23 September 2012, at 04:54.